Previous post: A New Contest! (Writing)! Isobel is on the hunt for her missing muse. 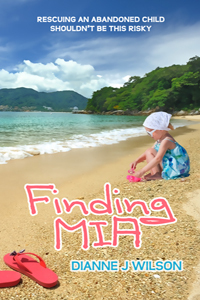 What she finds instead is an abandoned toddler who is sunburned and close to death. Dr Liam Brigham keeps little Mia alive, but needs Isobel to save the girl from a far greater danger–a killer with an agenda for kidnapping. With Mia’s life next in line, Isobel and Liam have to put aside their differences, face their past and throw their trust at the only One able to save. My Rating: 3 and 1/2 stars because of slightly mature topics. My Recommendation: 16 up for several reasons. I know it doesn’t sound like much but it is the sweetest line ever! Favorite Character: Isobel, I enjoyed reading about Isobel and how she learned how to trust more in God throughout the whole book. Least Favorite Character: Roric, who needs serious help! *finished reading* This book is very attention holding! I was sucked in in the first sentence. Each of the descriptions were wonderful, I loved each of the characters and can’t wait to read more by the author! The book did touch on hard subjects like suicide, human-trafficking, abortion, kidnapping, and unwed pregnancies so, it is better for 16 up preferable 17 or even 18, since the subjects were mentioned though with care while still showing how hard, sad, and hurtful each of the subjects truthfully are, without glorifying the sin. The end was slightly abrupt and a little too fast for me, but it won’t stop me from reading more from the author. I received this book in exchange for an honest review. This is a review request which you can find out more about here!